Habitat: This species can be found in pools, dams, lakes that are calm and do not have strong water flowing. Distribution: Widely distributed fish, can be found in most river systems such as in Kwazulu Natal, Gauteng, Mpumalanga etc. Description: Fins have red outlines and the underside is a lovely dark red colour. The upper body is a light green colour. 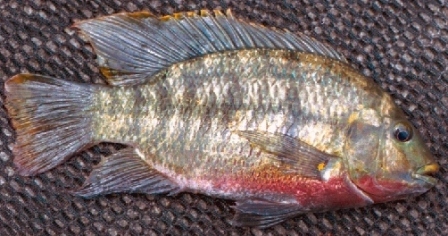 Fishing Strategy: The Redbreast Tilapia has bee introduced into a number of dams and lakes as a means of weed control. They can eat large amounts of vegetation and algae.